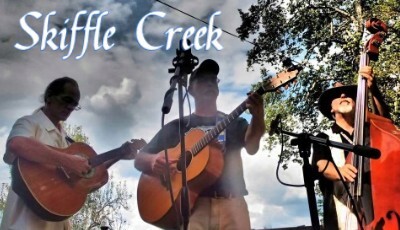 Skiffle Creek is a three-piece band from McDowell County. Their performance falls somewhere in the vicinity of "Woody Guthrie and Leon Redbone meet the B-52's and John Denver at a Tom Petty Tribute", or maybe something completely different depending on which night you see them. So, come on over & give a listen to this great local group and raise a glass to Americana based original and cover tunes. Freddy Bradburn, who has released several CD’s including critically acclaimed “Cartoonland”, heads up the trio.